Hi, everyone! Do you love patterned paper? Teri here to show you a card that features an easy way to embellish patterned paper with glitter, glue and a stencil! You are going to love trying out this fun DIY technique! 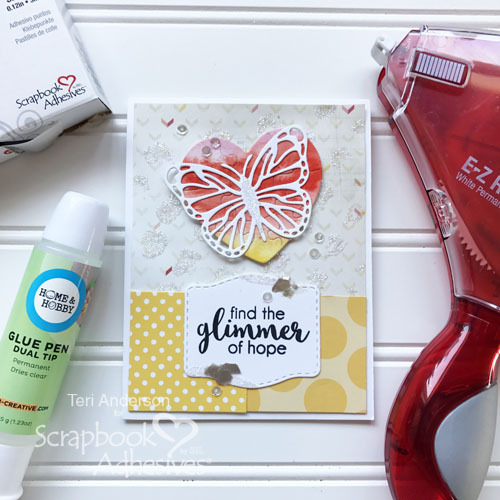 Adding glitter to patterned paper is easy with the Dual Tip Glue Pen and a stencil. I recommend using a subtle, soft-colored patterned paper for this technique so that the glitter will really stand out. Start by cutting the paper down to fit on your card or scrapbook page. Set the stencil onto your paper panel and then apply glue in the open spaces. If you are having trouble completely filling the openings with glue, use your finger (or a pallet knife) to spread it out. Remove the stencil and dump glitter all over the glue. Remove the excess glitter. Let the glue dry on its own. In a rush to put the paper to use? Use a heat gun to speed up the drying process. To complete my card, I adhered the glittered paper to it. And then I added a few more pieces of glitter-free paper toward the bottom of it. I placed a die-cut butterfly onto a heart. To give the butterfly a little sparkle, I applied some glue with my Dual Tip Glue Pen on the center of it and sprinkled a little glitter on top. I wanted the heart and butterfly to pop off the card so I adhered them to it with Thin 3D Foam Squares. The card needed a sentiment so I stamped some words onto a die-cut label. I wanted it to have a little bit of glitz as well so I applied some glue to the edges with the Dual Tip Glue Pen. Next, sprinkle some glitter and mica flakes onto the glue. Complete the card by adding a few small sequins. 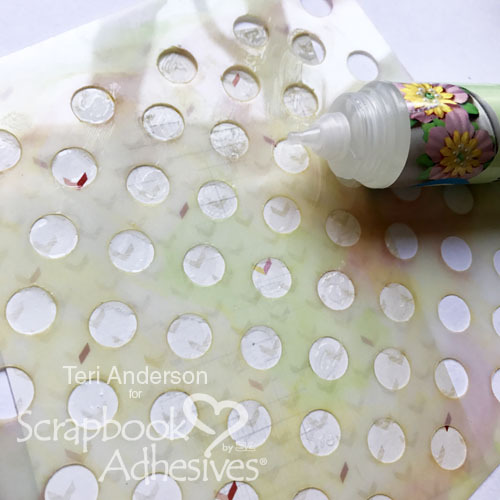 The Adhesive Dots Micro are perfect to use with sequins! They are just the right size for them. Are you inspired to play? 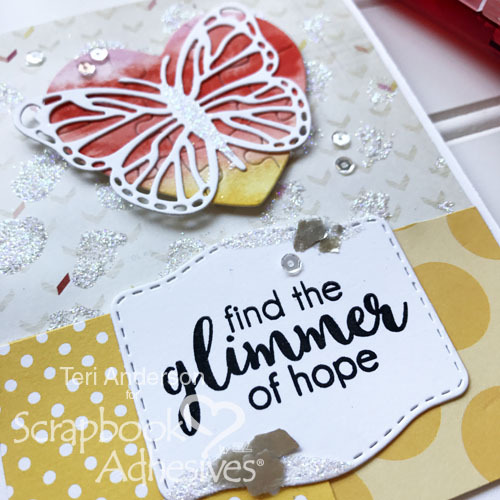 I’d love to see how you embellish patterned paper with glitter! Please share your projects with me by commenting on this post and sharing a link. This entry was posted in 3D Foam Circles, 3D Foam Squares, Adhesives, Cards, Crafts & Tutorials, E-Z Runner® Grand, HomeHobby by 3L, Other Adhesives, Permanent Adhesive, Tutorial, Wear your Adhesive on the Outside and tagged Adhesive Dots Micro, Card, Card Making, Die-Cutting, Dual Tip Glue Pen, E-Z Runner Grand Dispenser, E-Z Runner Grand Permanent Strips Refill, Glitter, HomeHobby by 3L, My Favorite Things, Stampendous, Stamping, Stencil, Technique Tuesday, Teri Anderson, Thin 3D Foam Squares White. Bookmark the permalink.